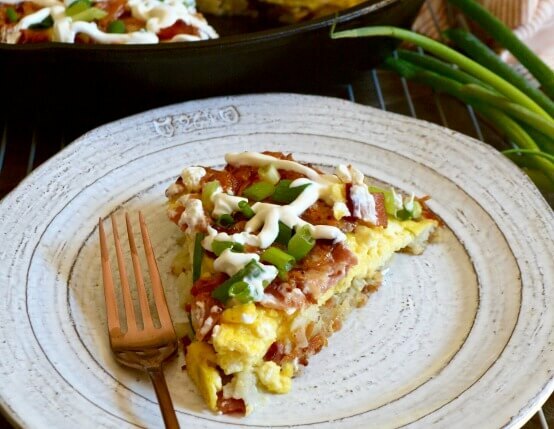 This gluten-free breakfast pizza features a crispy hash brown crust that’s topped with eggs, cheddar cheese, sour cream and lots of crumbled bacon. Heat olive oil in 12-inch cast iron skillet over medium high heat. In large bowl, combine hash browns, egg, melted butter, salt and pepper. Turn potatoes into skillet and press into even layer. Cook for about 8 minutes, or until bottom browns. Flip and press into even layer and cook for another 5 minutes. Prepare scrambled eggs by combining eggs, milk and 1 cup cheese in large bowl. Heat butter in medium skillet over medium heat. Add eggs and cook until just set. Remove skillet with crust from stove top and top with scrambled eggs, crumbled bacon and remaining cheddar. Bake in preheated oven until cheese is melted, about 10 - 15 minutes. Remove from oven, add scallions and a drizzle of sour cream. Serve warm.